Consider giving your commercial property a deep clean with pressure washing! The task of maintaining the cleanliness of your commercial property is never ending. It can be especially difficult if there is a lot of traffic as the property can quickly start to look rundown if it’s not constantly maintained. With professional power washing services from Atlantic Maintenance, we will take care of that for you. 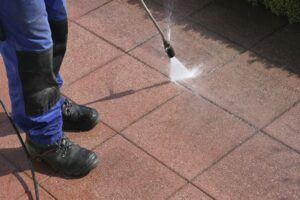 These are just a couple of the many benefits of pressure washing your commercial property. No one wants to be in a germy place. It is surprisingly easy for mold and mildew to form and grow, especially on the roof. Power washing gets rid of all that and prevents new growth from forming. Mildew stinks; employees and customers will all appreciate an environment free from this unpleasant odor. Mold and mildew are also very common allergens, so power washing your commercial property can also make it safer! Keeping the exterior of your commercial property properly cleaned is a huge job. It can also be extremely time-consuming and potentially dangerous. If you’re using equipment you’re unfamiliar with and climbing up tall ladders, you could be injured. Let the professionals at Atlantic Maintenance take care of all of that for you. We will keep your commercial property looking great so all you have to worry about is running your business. Regular cleanings are good for everything. Your commercial property is no different. Maintain the exterior of your commercial property with power washing from Atlantic Maintenance. With a regular power washing schedule, your property won’t get the chance to look dirty or run down which will help keep your customers happy. This entry was posted on Friday, June 16th, 2017	at 5:52 pm	and is filed under Landscaping Maintenance	. You can follow any responses to this entry through the RSS 2.0	feed. Both comments and pings are currently closed.